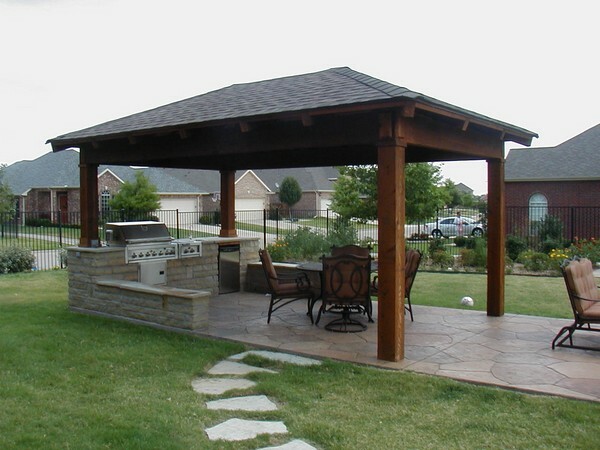 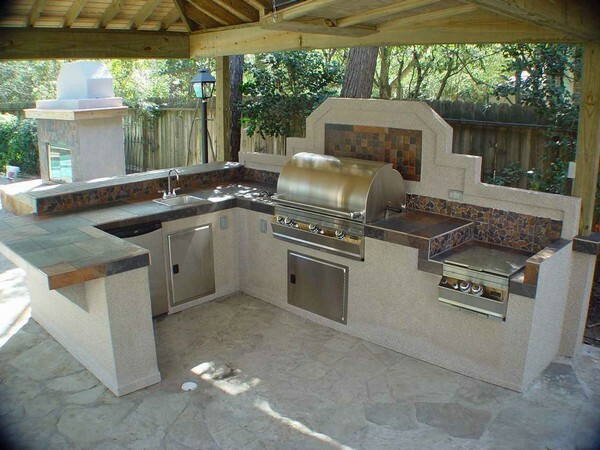 If you are thinking of utilizing that extra space outside your house, then you should definitely consider creating an outdoor kitchen, especially if the space is minimal and does not allow you to create big structures such as swimming pools. 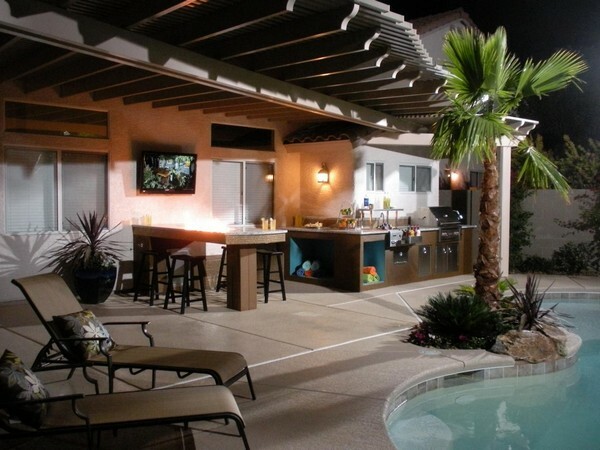 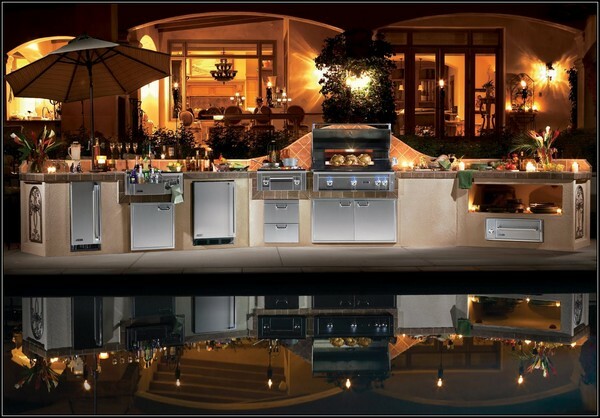 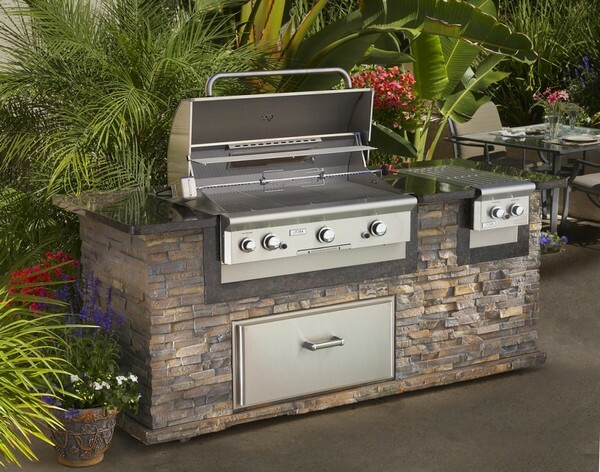 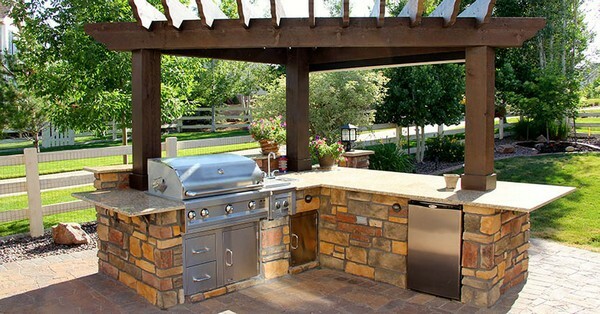 Some of the basic elements to consider when setting up your outdoor kitchen include; lighting, appliances and furniture. 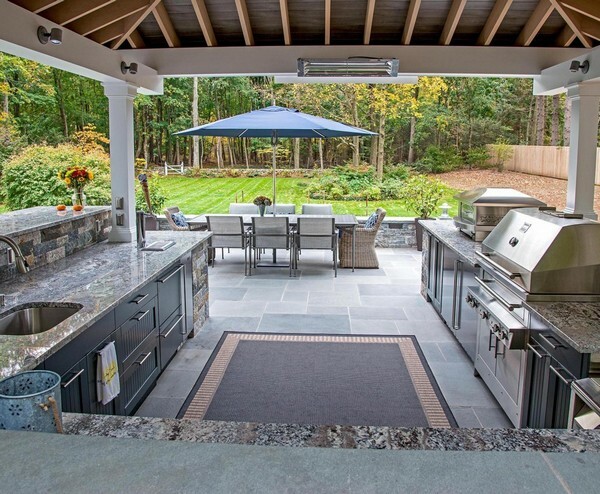 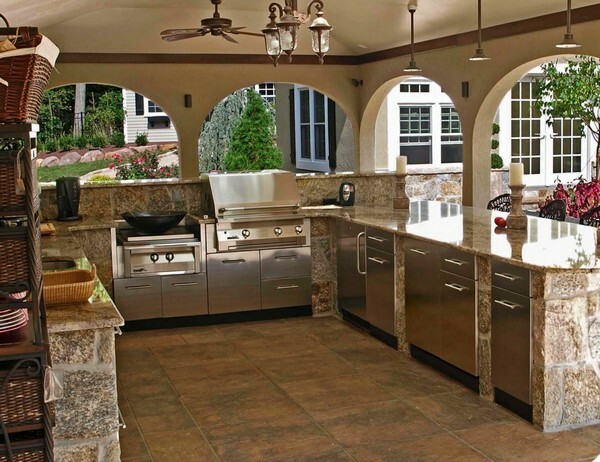 An outdoor kitchen will come in handy when you have to host events at your home, or even when you just need a relaxing day outside cooking your favorite meals and enjoing the outdoors. 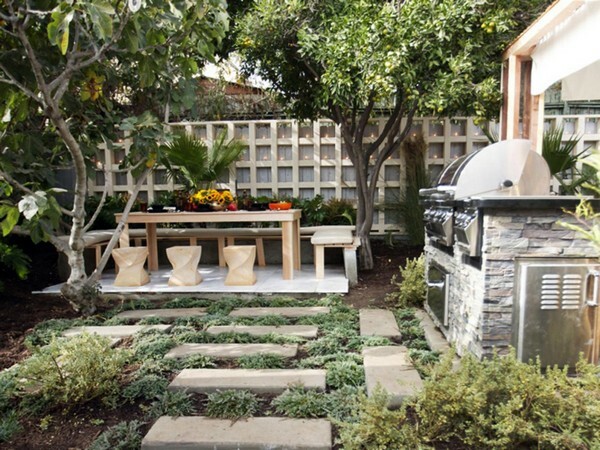 If you have a spacious garden, then all the better for you, because there are no limitations to what you can do with the space. 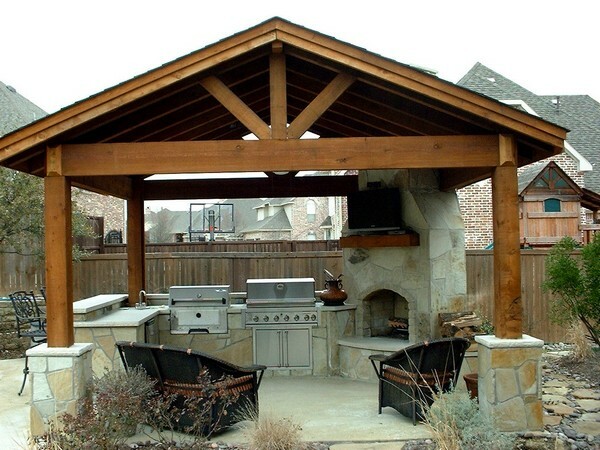 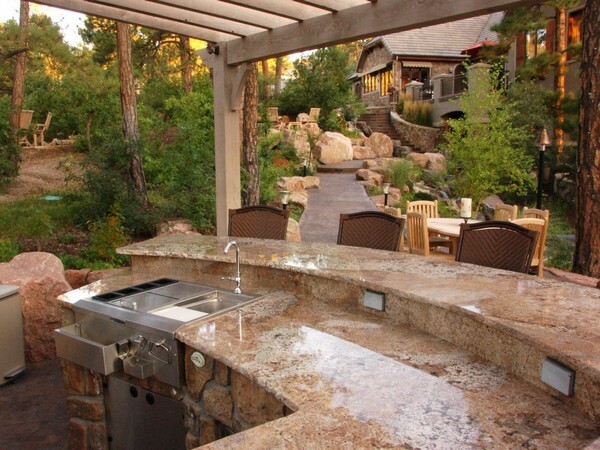 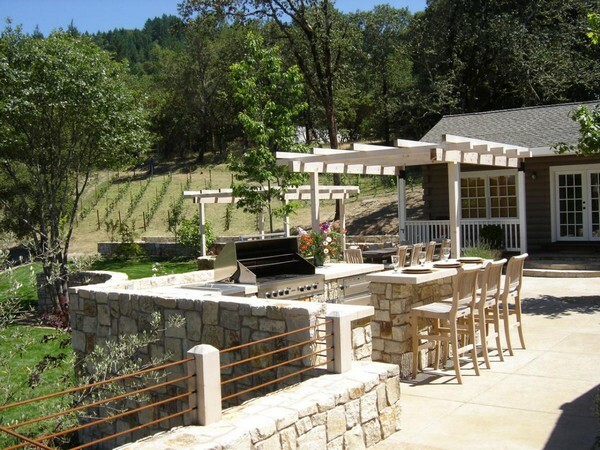 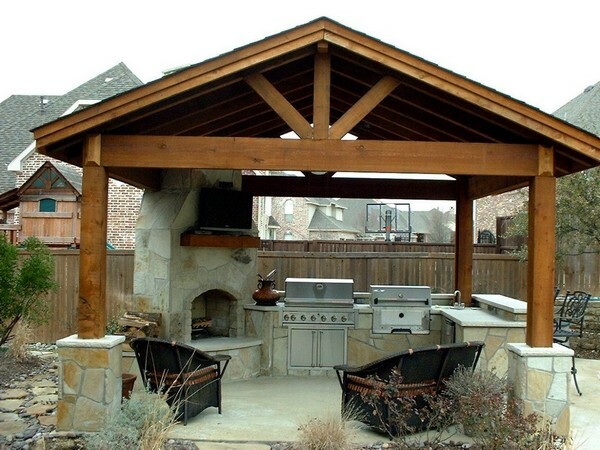 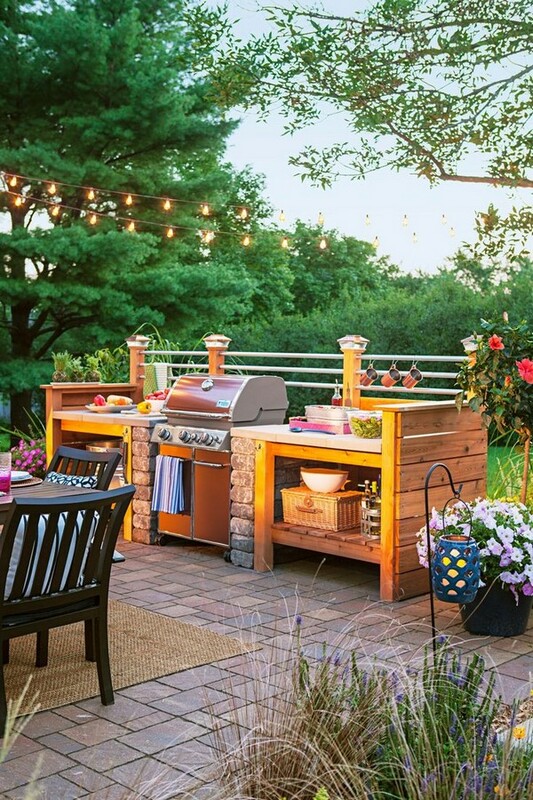 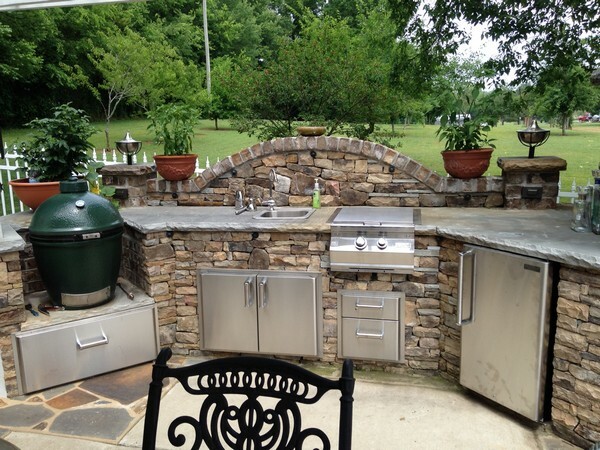 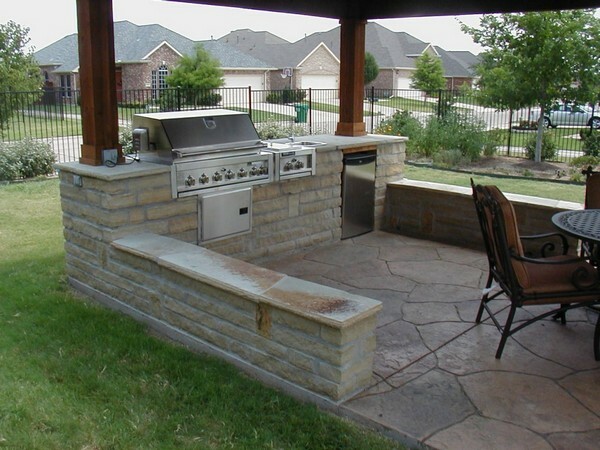 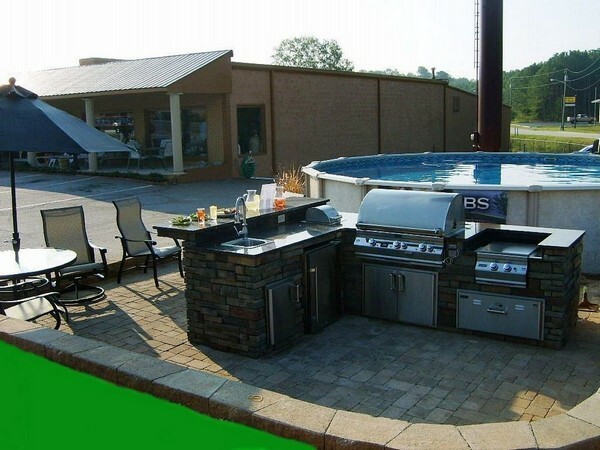 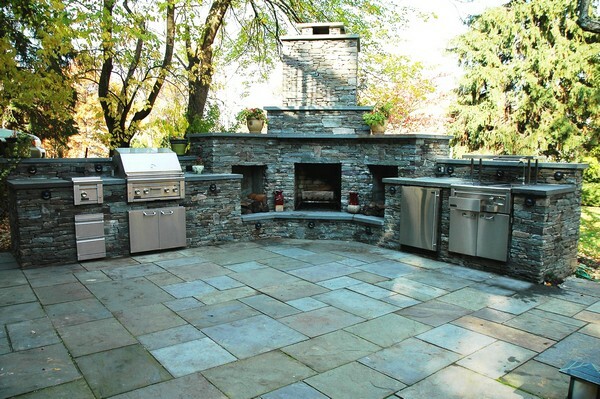 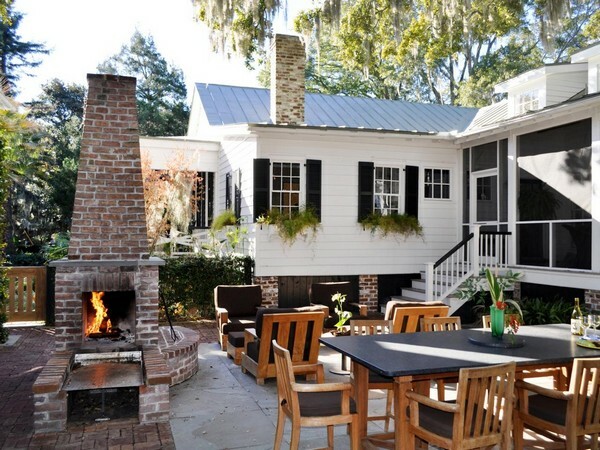 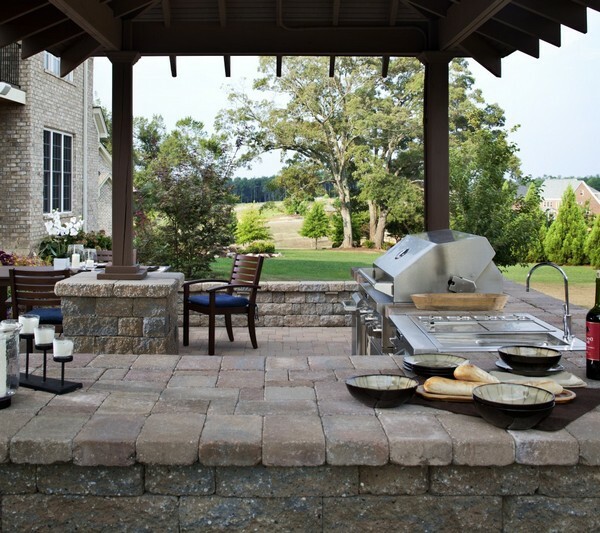 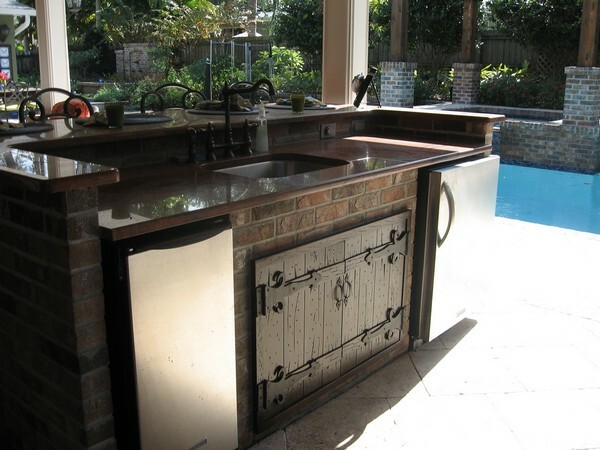 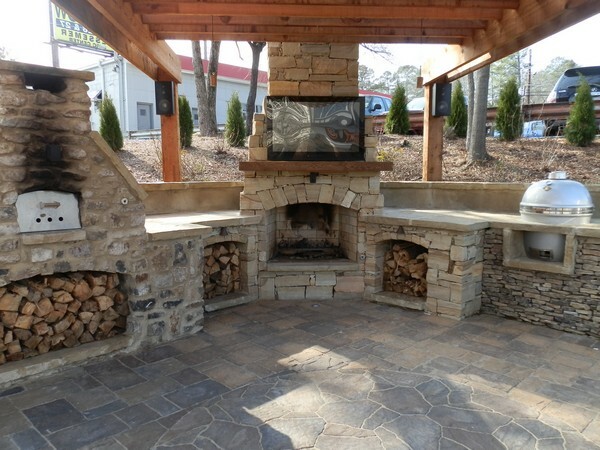 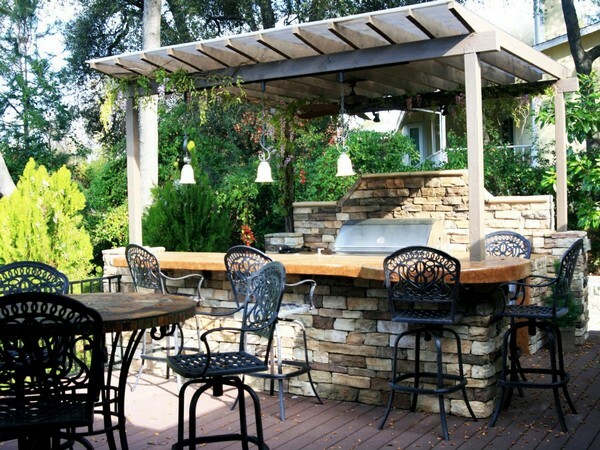 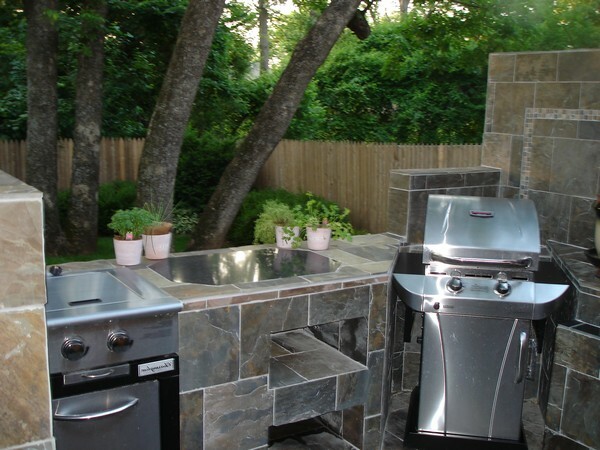 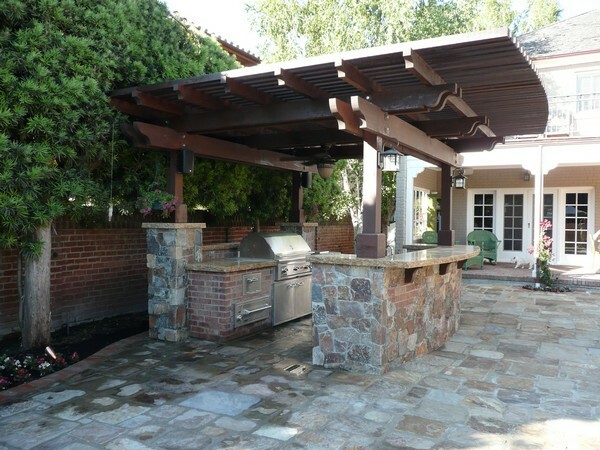 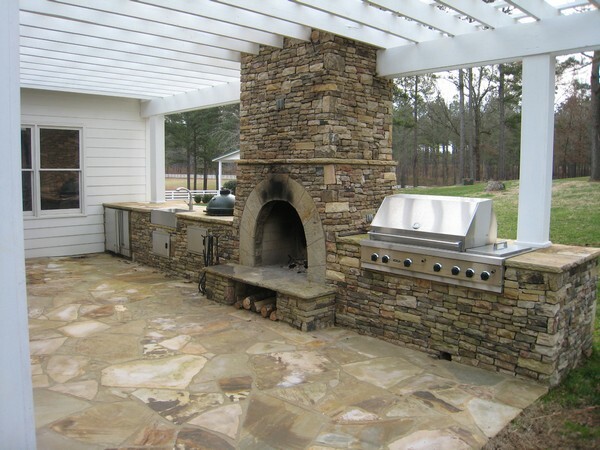 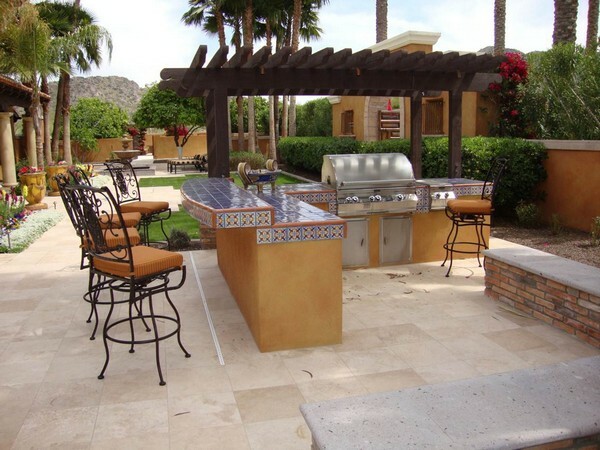 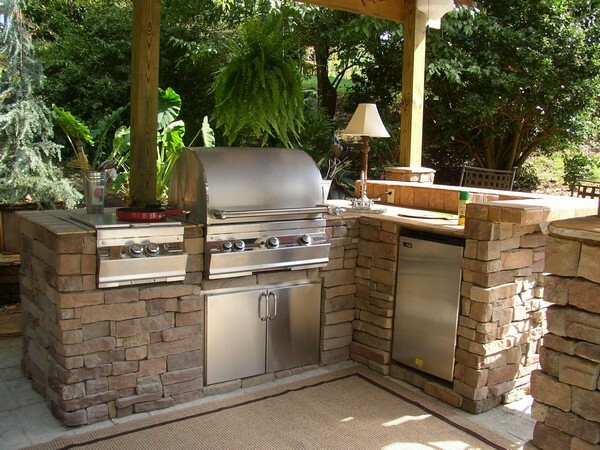 You can combine an outdoor kitchen with other outdoor features like fire pits and swimming pools. 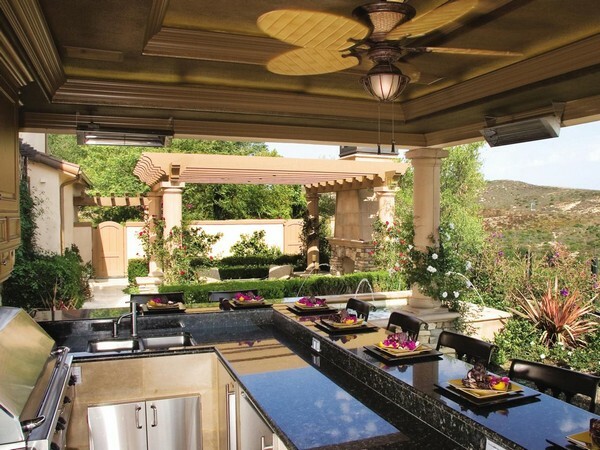 The expansive garden and swimming pool offer a breathtaking view for those in this outdoor kitchen. 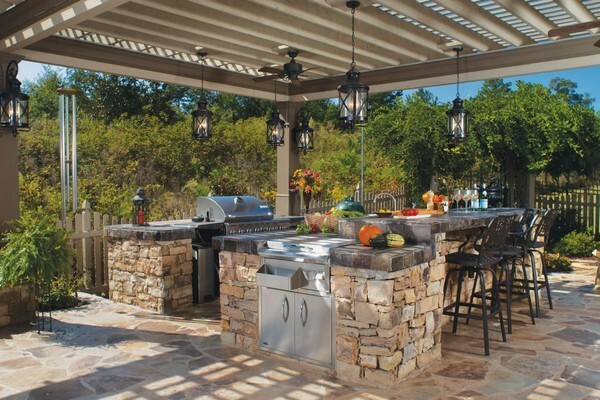 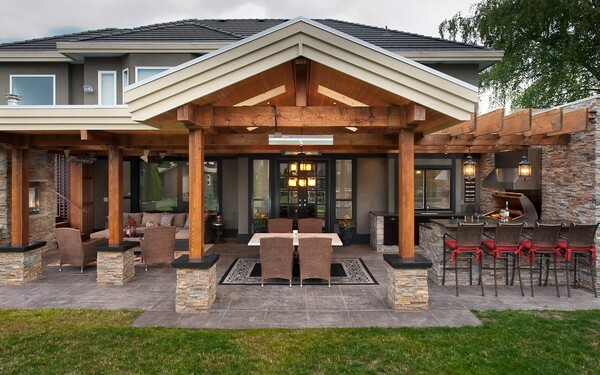 Here, the outdoor kitchen has been placed under a gazebo, transforming it from a simple outdoor kitchen to a romantic and blissful space that promises to take your breath away. 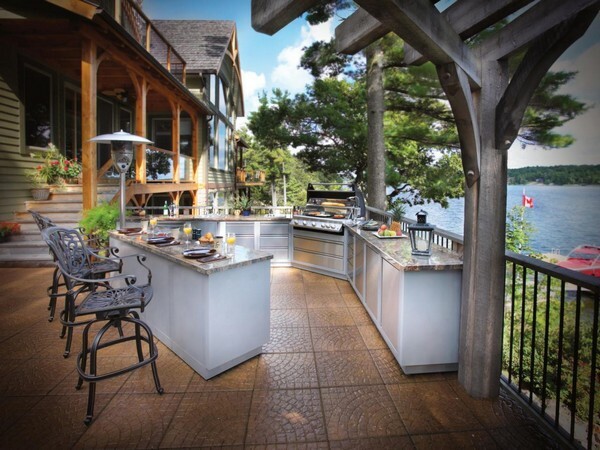 The soft neutral drapes can be drawn to offer privacy and drawn back to offer the beautiful and romantic view of the blue water and trees in the background. 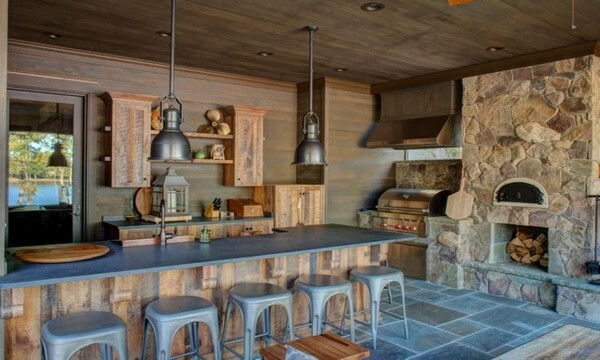 This kitchen also makes use of another important element-lighting. 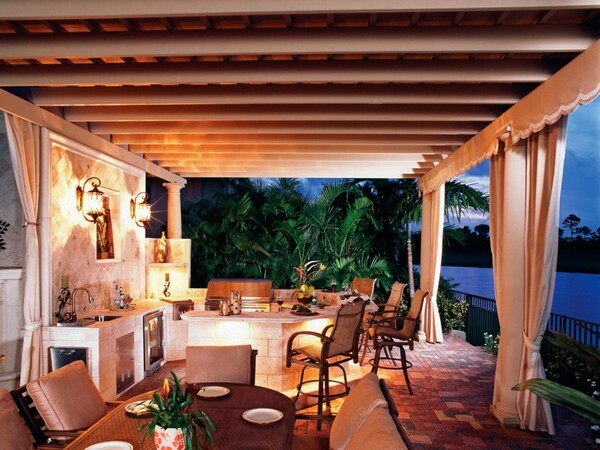 The minimal lighting in a soft hue sets up this dining area as a perfect one to hold a romantic dinner with a loved one. 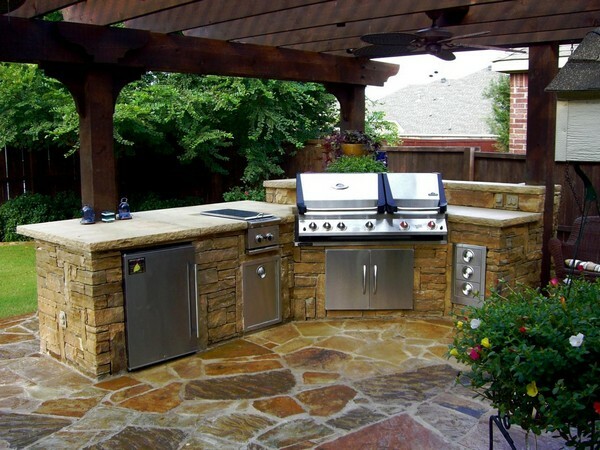 There is a wide range of materials you can use for your outdoor kitchen design, with the most popular being stone and wood. 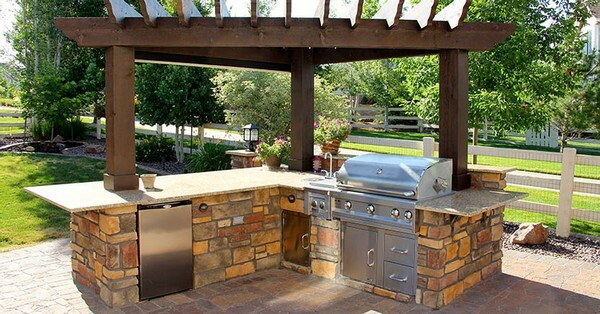 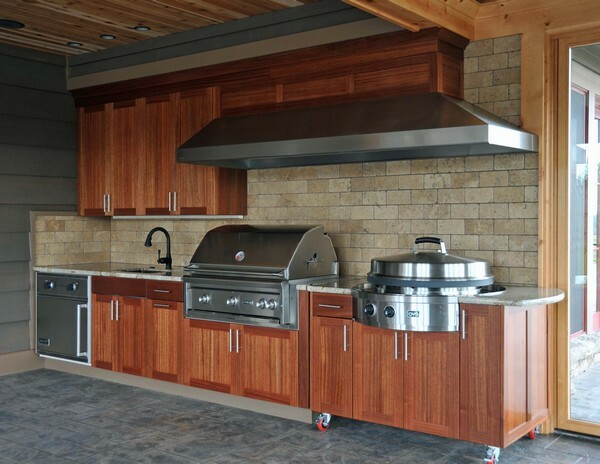 This simple outdoor kitchen makes use of stone, wood and metal to achieve an appealing rustic look. 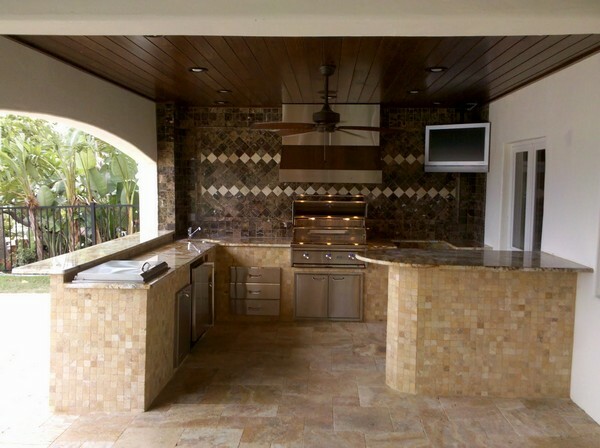 The cooking appliances like the stove and the grill have been integrated into the island-like structure with stone countertops, which saves space. 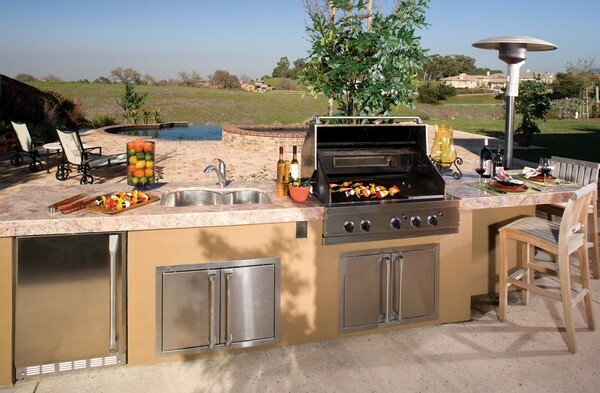 This is an easy space-saving solution for those with limited outdoor space. 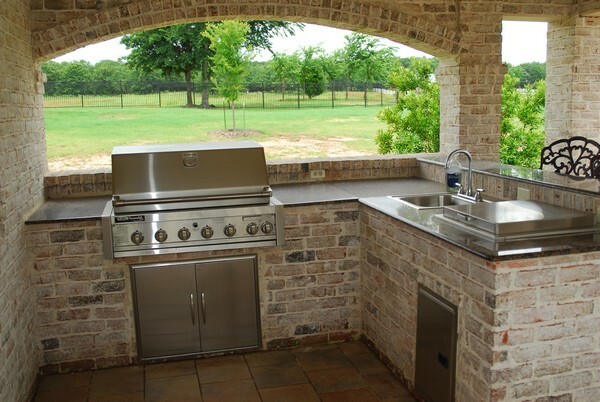 If you would like the experience of an outdoor kitchen but do not wish to adopt a fully outdoor kitchen design, then you can make the outdoor and indoor designs meet halfway, as can be seen in this kitchen here. 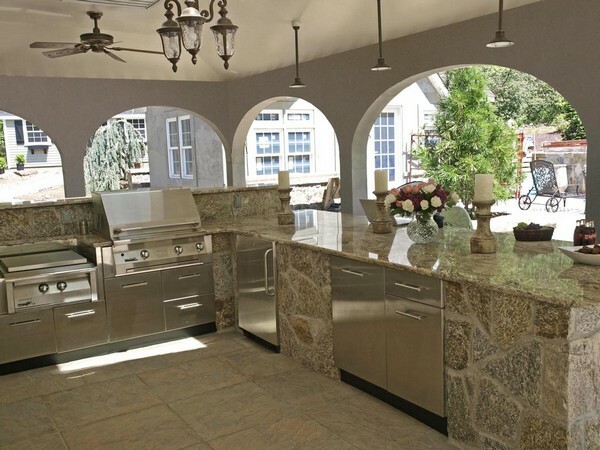 The large open arched windows create the atmosphere of an outdoor kitchen without it being fully an outdoor kitchen. 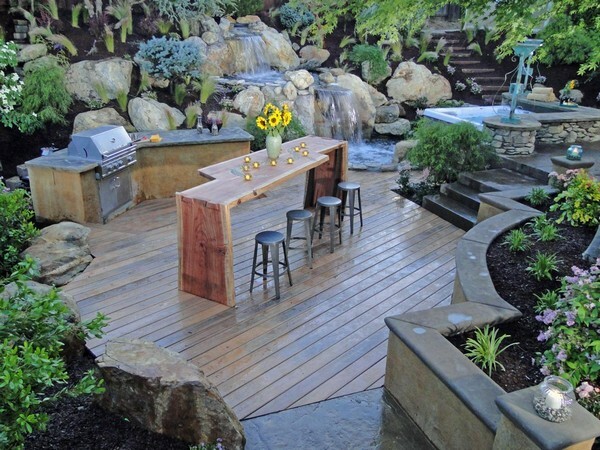 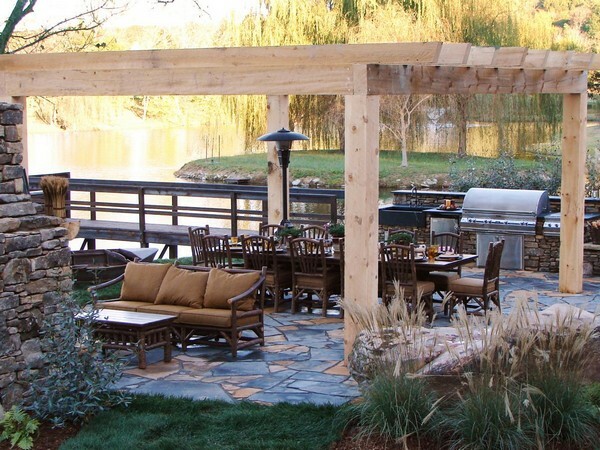 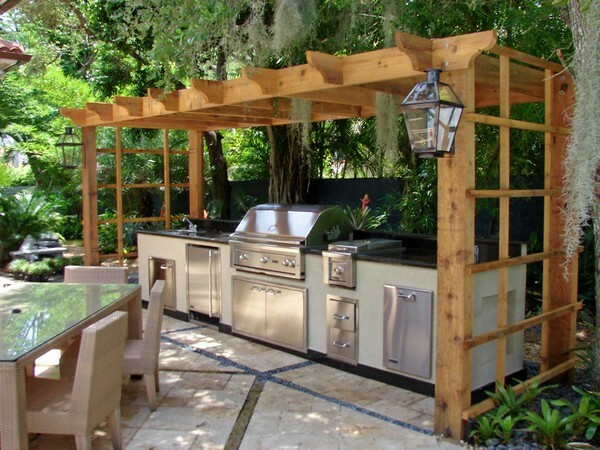 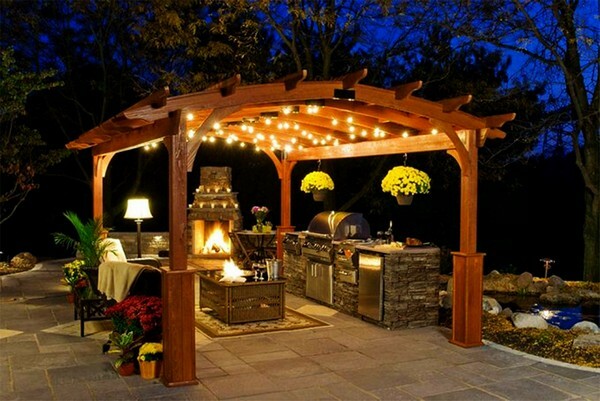 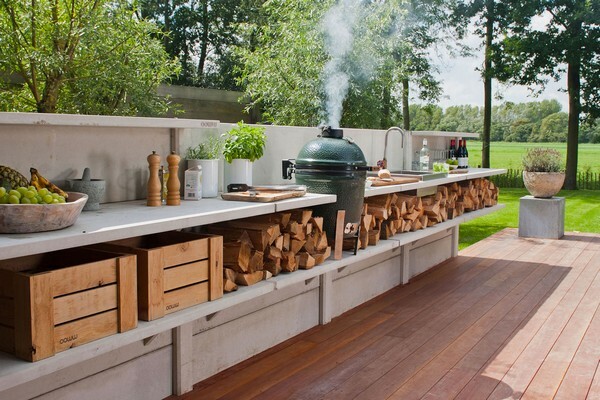 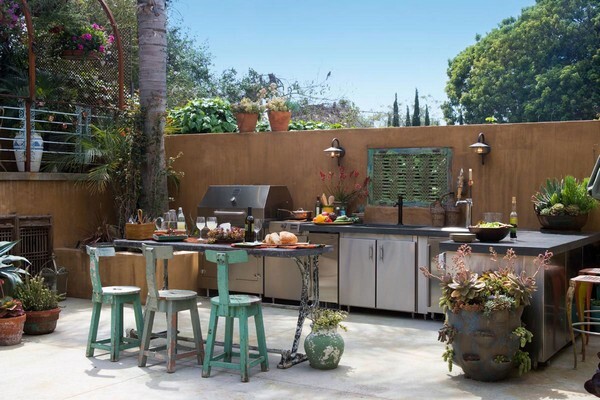 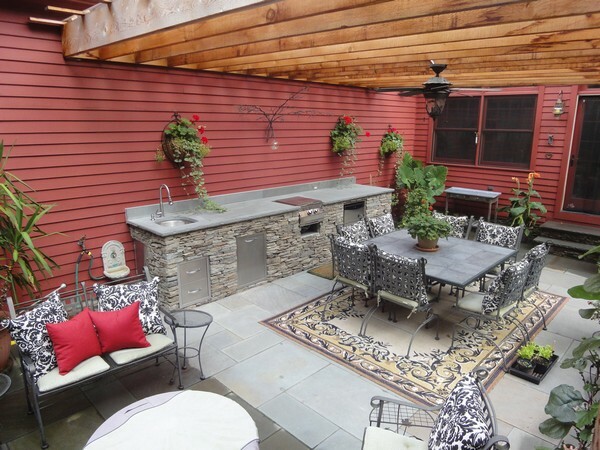 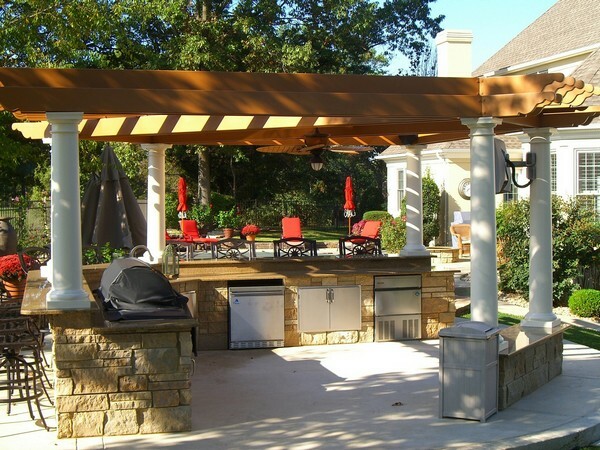 What better way to create the feeling that you are in an outdoor kitchen than if you are surrounded by trees, flowers, shrubs and all other features characteristic of the outdoors. 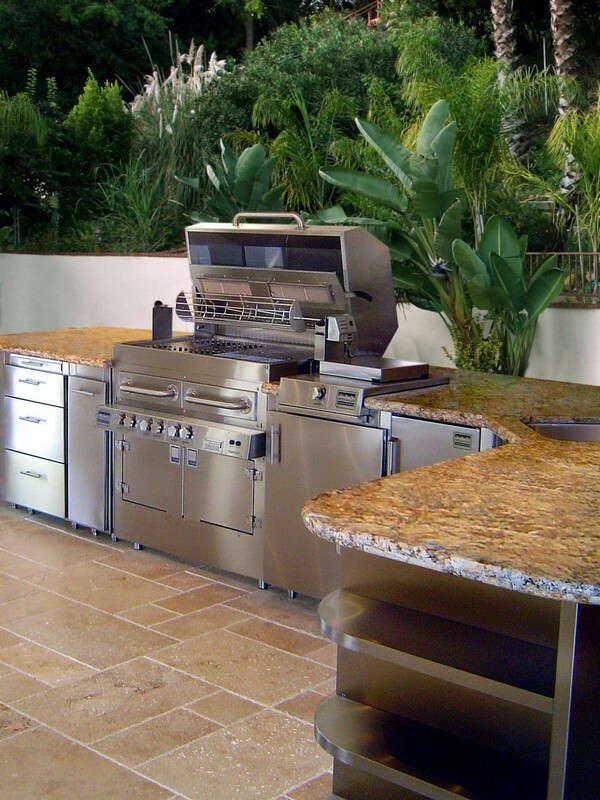 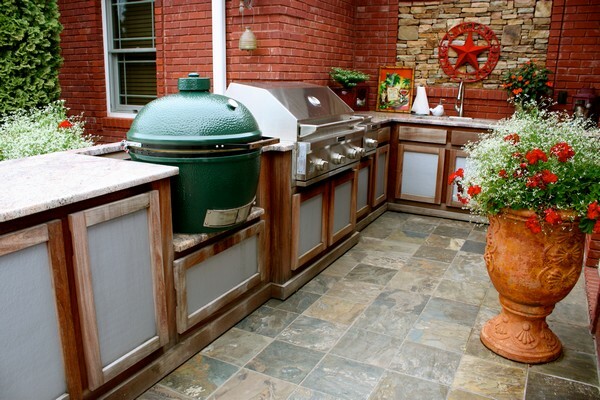 The furniture is as much an important aspect as the cooking appliances when it comes to an outdoor kitchen. 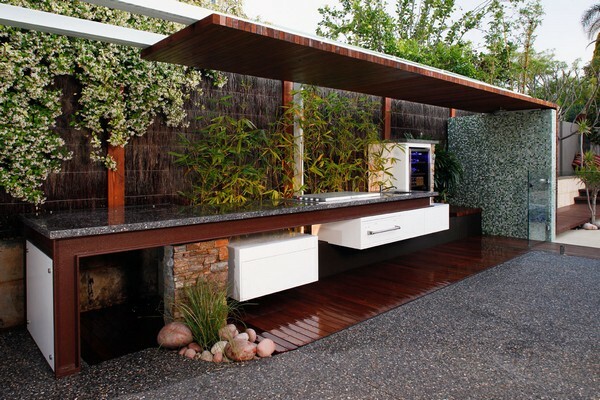 Just because the term ‘kitchen’ is attached to the space does not mean the space cannot serve other functions. 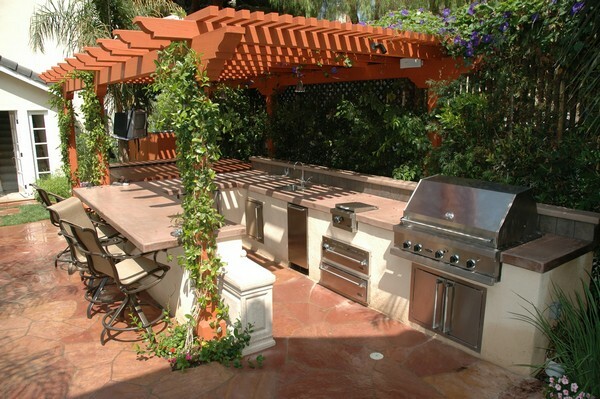 This kitchen, for instance, presents multiple seating plans. 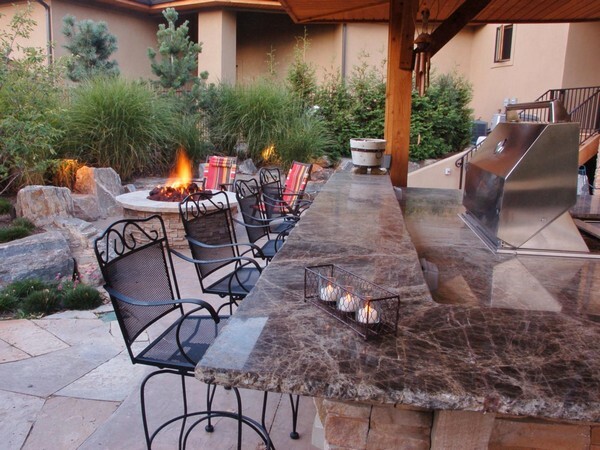 The arm chairs with thick dark brown cushions are perfect for just relaxing, or just sitting as you wait for your meal to get ready. 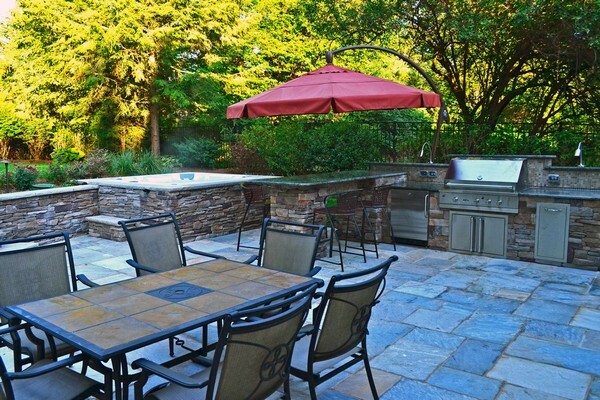 The dining chairs are perfect for dining with family or friends. 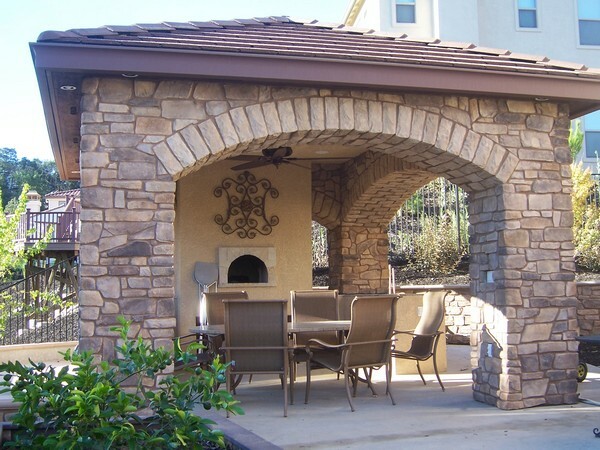 The brick fireplace adds a ‘homely’ ambience to the space, making diners feel at ease and welcome.